Situated on the Parramatta River at the end of Great North Road, Abbotsford Sailing Club operates every Saturday between September and Easter (except Christmas & the first 2 weekends of January). There is a social winter program held as well. Whether racing around marks in squally weather or pottering up and down on a sunny day, Abbotsford Sailing Club can provide an environment to fulfil all your sailing ambitions. 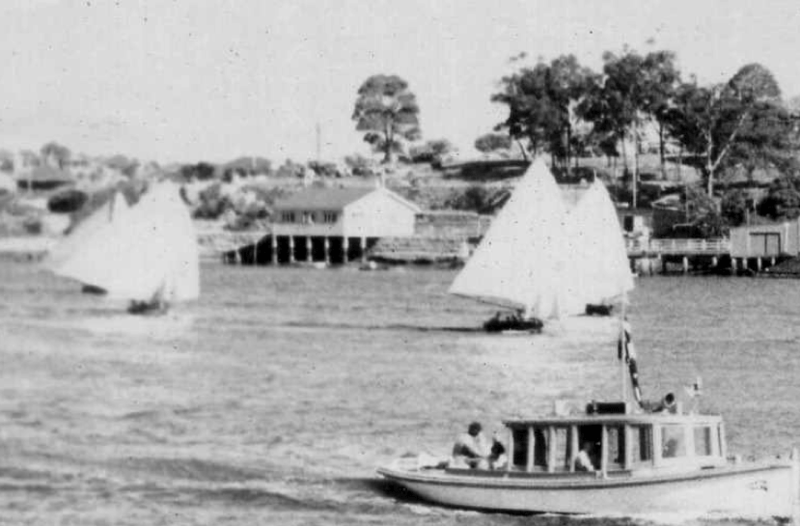 Early in December during the summer of 1935, a few twelve foot skiff owners and crews assembled in the old band rotunda, situated in Cabarita Park, on the banks of the Parramatta River. It was an informal gathering, called together for the express purpose of discussing the pros and cons of forming their own sailing club. In fact it was a short while later on January 6th 1936 that the "Concorde 12 Foot Flying Squadron" was formed which eventually became the "Abbotsford 12 Foot Flying Squadron." In 1937 the club name was changed to the "Concord, Abbotsford, Gladesville Flying Squadron" but was commonly known amongst sailors as 'CAGS'. The final name change only occurred in January 1952. Presentation night is 25 May. Please mark this date in your calendar.This year, presentation night will be at Canada Bay Club, 6:30 pm for a 7 pm start. Costs is $40/adult and $20/child (Under 14). Please RSVP before 1 May to Gai or Judy. Sorry no late entries. Would you like to support the future of the club? Abbotsford 12 SC has teamed up with the Australian Sports Foundation to give a tax deductible donation to the club. Please visit our funding page if you would like to help secure the future of the club! Support boat roster. This is now on the club calendar. Please check the club calendar for your assigned dates. Next club meeting: Check the club calendar, all members welcome. Abbotsford now has a Youtube channel. Videos from racing have been posted. Register for Learn to Sail on this website! Experience the sport of sailing at Abbotsford 12ft Sailing Club. The club offers opportunities to Experience Sailing and receive continued training in sailing for young and old. We offer a season long training for beginner youth sailors 9 - 14 yr old. Over 2018/2019 we will not run a formal Learn to Sail program, however, if you are interested in learning to sail, please register your interest via the Learn to Sail page, or come by the club on Saurday afternoon. Children need to be prepared to get wet! Children need to be able to swim and must be confident in deep water however PFDs (Life-jackets) will be provided by the club. Club training Optimists kindly provided by the Boating Industry Association and Yachting NSW.